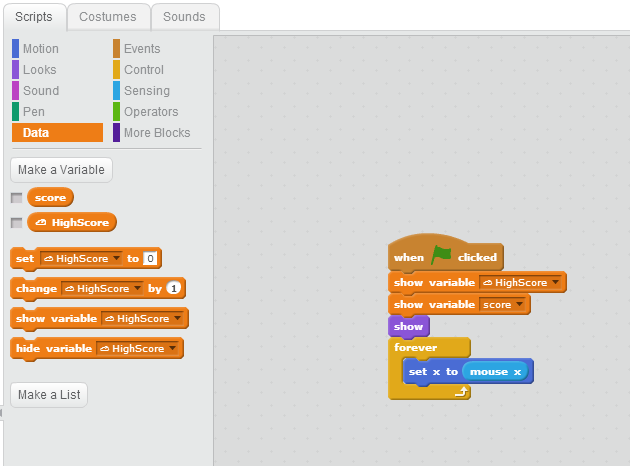 The Scratch 2.0 BETA is out now! I’ve been waiting long for this update on my favorite visual programming language, I’m very exited so I feel like sharing my first impressions with you. First, the name 2.0 is exactly what the BETA is all about. Web 2.0, meaning the strength of sharing as a win-win situation for both the consumer and the producer, is clearly the core phenomenon in this update. Wikipedia, YouTube, cloud services and social networks are all great examples of that. 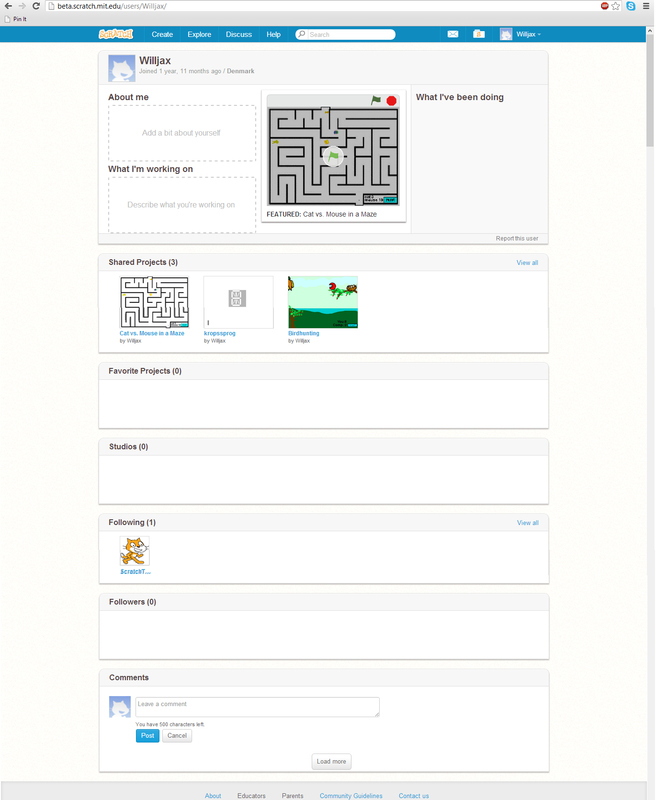 Scratch now implements more characteristics from social networks and 2.0 initiatives, such as cloud stored data, a browser-based platform, social RSS feed, a profile page and the ability to follow other users and be followed. When entering the BETA page, you see a bunch of featured projects. I entered the “Apple Catch”-project and signed in (my account name is Willjax) and immediately was given access to the browser-based coding environment. I now have complete access to remix, republish, or start “from scratch” with a new project. No download, just inside your browser! MIT is working on a download version for offline use, if you prefer that. You will still need Adobe Flash 10 or later though. The coding environment looks the same but a lot is different. You can now more easily copy-paste content between sprites or from one project to another, using the backpack. This feature, along with the sprites now being able to copy themselves, solves the biggest issues from the previous version! Earlier, sprites wasn’t able to appear two places at once. You had to create a new sprite for every appearance, even if they were completely identical. Another cool thing, is the cloud data storing inside the code. You find this script in the data tab. This lets you store codes, statistics, variables and sprites online. You can use this for keeping high score data, tracking the process for everyone who plays it, letting them rate their favorite sprites, ect. popping balloons is fun. 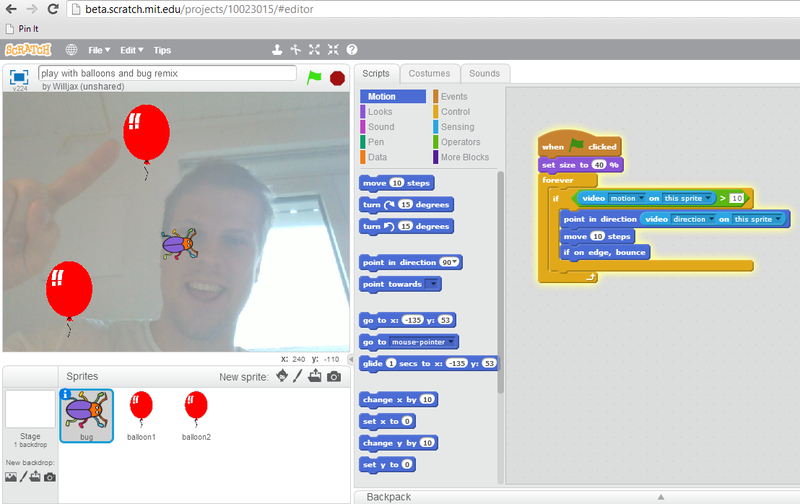 This is an example of the webcam integration with movement detection. The most impressive new feature is the webcam integration, that even tracks the movements and lets you interact physically with the project, using hands, head or whatever you are capable of moving and shaking around. It’s a lot like the Kinect, though the Kinect tracks the depth of the video, Scratch tracks movements. This means, that when not moving, the webcam won’t be able to track you. The profile page. As you see, I have no followers! For the more social functionalities, the profile page is definitely interesting. Just like your Facebook profile, though a lot more simple, you can show your recent projects, write about yourself, show what projects you are working on, show your favorite projects, followers, following, and finally: comments. For now, the help pages are still under construction. Maybe that’s because they are not crowdsourced like the Scratch Community Page. A little more “2.0” here would be nice. The best way to find help and inspiration is still by asking other users. 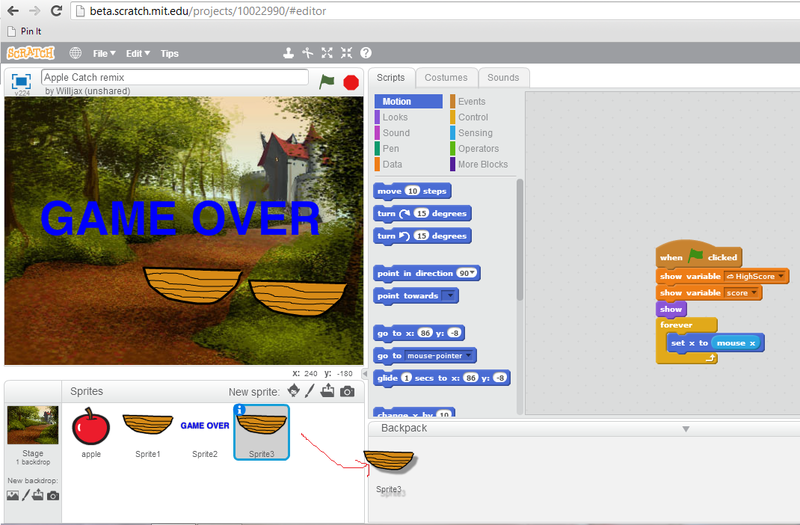 And maybe an iOS/Android/Win RT-integration for creating apps for smartphones and tablets, using Scratch 2.0. ← control LEGO robots with your smartphone – LEGO Mindstorm EV3 announced! issue, it may not be a taboo subject but generally people don’t discuss such issues. To the next! Many thanks!! tvinge seg inn i normer som strider mot våre lyster og begjær. Er du av den spontane typen eller kansje bare kjempe kåt.